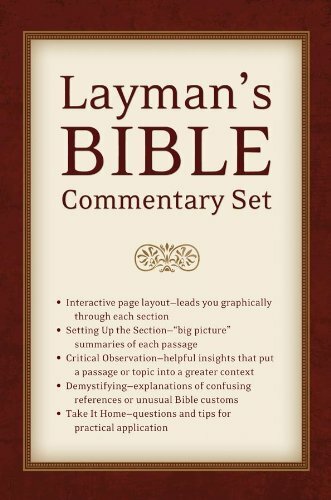 Heres an accessible reference that aids personal Bible study or Sunday school preparationthe Laymans Bible Commentary, reference for the everyday Christian, not the scholar! This 12-volume set covers all 66 Bible booksfrom Genesis to Revelationproviding section-by-section commentary on the flow and theme of each book, as well as historical and literary context for each. Major interpretations are presented for controversial passages and topics. Puzzling passages and Bible practices are explained, and charts and diagrams further aid your understanding. And Take It Home segments provide a practical application for each passage. Dr. Stephen Leston is the director of the Center for Pioneer Church Planting in Los Fresnos, Texas. Prior to training church planters to minister to the unreached, Stephen served as pastor-teacher of Kishwaukee Bible Church in Sycamore, Illinois. He also pastored churches in Petersburg, Alaska, and Warrenville, Illinois. For over 20 years Stephen has been passionate about teaching God's Word and training people to teach God's Word to others. He is the author of Illustrated Guide to Bible Battles as well as several commentaries in the Layman's Bible Commentary series. He is married to the love of his life, Heather, and has four children.